Skickar idag om du beställer innan 8 timmar and 50 minuter! Whether building a new surround sound system or expanding an existing setup, the TL1 satellite speaker delivers great surround sound in a tiny package that can be placed virtually anywhere, at a price that will make you smile. The TL1 comes with 0.5" silk dome tweeter and 2.5" mid-bass driver, and incorporates Polk innovations engineered for optimum performance from a compact cabinet. The result is clear, dynamic sound that steps up you family fun and entertainment excitement. Don't settle for flat sound from your flat panel TV, and don't miss out on the excitement of digital surround-sound in your shows, movies and games. Sold in single unit. Available in Black and White finishes to match your room fashion. Time Lens technology aligns the acoustic centers of the tweeter and mid-bass driver on the same spatial plane for superior imaging, while an acoustic lens incorporated in the grille smoothes the tweeter's frequency response. 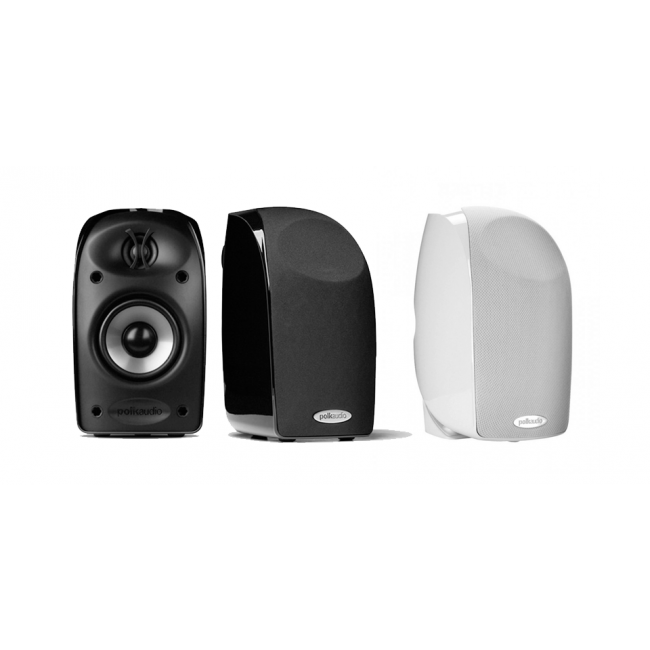 Because of its Extended Linear Motion motor structure, the moving parts of the drivers used in the Blackstone TL Series can move farther, more smoothly, in a smaller space than any other speaker driver in an enclosure this size, achieving the kind of dynamic response (clarity, volume) you'd expect from much larger speakers. The Blackstone aerated polypropylene cone is lightweight, but stiff and strong, with longer linear excursion capabilities in a limited compact enclosure space, so it plays louder with less distortion.A super-small long-throw mid-bass driver, tuned with our exclusive Dynamic Balance technology, delivers astonishingly smooth, flat frequency response, superior transparency and detail, and the surprising ability to play really, really loud for such a small speaker.Polk's exclusive Dynamic Balance technology allows Polk’s engineers to design out distortion-causing driver and system resonances, so you only hear the good sounds.Hi-Gloss "Blackstone" finish, a durable, deep automotive-strength finish, matches today's most stylish flat-panel TVs and furniture.Compact means go-anywhere for Blackstone TL: on shelves, on the wall, or on stands. Built-in keyhole slots and threaded inserts (that fit virtually any brackets) give you multiple mounting options.Gold-plated, professional-style 5-way binding posts allow for the most secure connection options.